This year was my hubby's big 4-0. For weeks I practiced making cakes for his party (baking cakes in high altitude can be a little tricky). I made chocolate cakes, lemon cakes, chocolate ginger cakes and more! 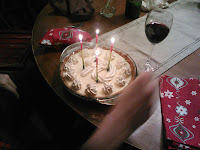 When the week of his birthday came and I asked him which cake he wanted, he answered with...Key Lime Pie?! A pie that I had never made or even eaten before! Tuns out that Key lime pie is super, super easy to make! I even found a way to make it egg free in consideration of our dear friend who doesn't eat eggs. You can buy pre-made graham cracker crumbs, but they're really easy to make. Just break up some crackers and put them in the food processor and let it do the work for you. You can also put small batches of crackers in a large Zip-Lock bag and roll over them with a rolling pin. 1 1/2 cups is about 1 1/2 of the little packages within the graham cracker box. If you're using the food processor, add in the butter and sugar and process until combined. Otherwise mix all of the ingredients together in a large bowl until well mixed. Press the mix into the bottom and sides of a pie pan (or little pie pans) to form the crust. I like to pre-bake the crust at 350 for about 5 minutes to allow it to set up before I fill it. You can combine the ingredients by hand with a whisk or with a mixer over low speed. Combine the condensed milk, sour cream and zest first, then add in the lime juice. Once combined, pour the filling into the graham cracker crust and bake at 350 for 15 minutes (10 minutes for the mini pies). Do not allow the pie to brown. 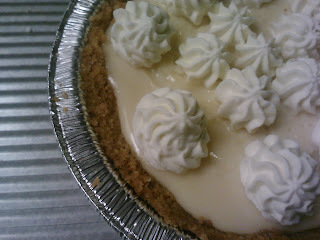 Cool completely before serving and service with freshly made whipped cream. P.S. When I made the mini pies today, I used fat free sweetened condensed milk and fat free Greek yogurt and the pies turned out great!